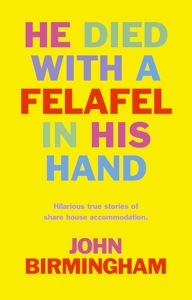 He Died with a Felafel in His Hand now on iBooks - Hourigan & Co. He Died with a Felafel in his Hand is now availabile on iBooks for the first time. Download it for reading on your iPad, iPhone or iPod touch, for just $9.99. John Birmingham’s tale of sharehousing squalor is a modern Australian comic classic, also available via Amazon for Kindle. Keep an eye out for more of Birmingham’s early work in the ebook format in coming months.